Hands up if you love the smell of summer and want to smell like it all year round! *raises hands* This girl right here is obsessed with beachy scents (mark. Saint Barts Soleil is one of my absolute favourites) so I was obviously very excited to get my hands on CLEAN Ultimate Beach Day at a media event a few months ago. I've posted about CLEAN before (here and here) and no doubt the company continues to impress with its simple and refined fragrances that can be layered to create a unique-to-you scent. This latest offering comes housed in CLEAN's standard rectangular bottle but features a subtle glittery ombre glass. 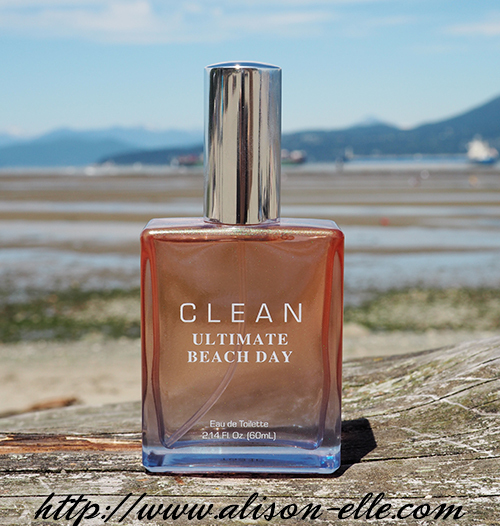 "Inspired by a carefree day at the beach, this refreshing fragrance offers a citrus floral escape. The scent opens with summery notes of mandarin orange, Italian bergamot, lemon, and Kaffir lime. The heart mellows into a bouquet of white rose, tuberose, soft neroli, jasmine, African orange blossom, and lavender. Crisp seaside notes add subtle bite to balance the softness of the flowers. The dry down embraces with notes of amber, musk, and sun-soaked sand." It's hard to describe this perfume but to me it smells like the perfect blend of sunscreen, sand, and salt water... you know, basically like the ultimate beach day (no kidding, haha). It's a little powdery but not too much and I already know I'm going to be wearing this a ton as temperatures rise and the sun continues to shine. I love the smell of Summer. I especially love the smell in the morning right after it rains (brings me back to my sports days and early morning practices! ).